The repertoire complete . . .
Molly exhibits her star find — a carved stone ball. We have found a carved stone ball! There you have it. We have ransacked our store of superlatives, but the extraordinary nature of this find has left us with just those plain, simple, but momentous words. Here they are again. We have found a carved stone ball! And the importance of this? Well, hardly anyone has ever found a carved stone ball in a modern archaeological context. The vast majority have been found, by chance, as dislocated finds across Britain, but with an apparent concentration in north-east Scotland. One was found last year at the Links of Noltland, on Westray, but we are unaware of its context. And that is the really exciting part of this discovery. The ball was found in a secure context, under the north-east buttress of Structure Ten, opposite the magnificent incised stone found last week, which was also under a buttress. We certainly don’t want to leap ahead with interpretation, but it is beginning to look as if these special deposits, under buttresses, might constitute something like foundation deposits for the entire building. The ball is heavy and initial impressions suggest that it may be basalt — a very hard and uniform stone — which works well, with a great deal of time and patience. The stone is, of course, still coated with midden so its exact nature is still to be determined. We can, however, determine that it has six knobs, but not apparently even spaced. There may be extra decoration incised into its surface. It may even be coloured or painted. Information on all this will only be clear when the very delicate job of cleaning it without disturbing any deposits is carried out. This will take place at a conservation laboratory in Edinburgh. The baulk across Structure Twelve is cleaned and prepared for drawing and sampling. We are beginning to worry about site director Nick. He has been grinning all afternoon. Welcoming students over the past years, he has always stressed that the object he really would like to find here to complete the repertoire of Neolithic material culture is a carved stone ball. Now that has been accomplished, has he anything else (archaeologically speaking, of course) to live for? Actually he has. The grin is fading, although the tremendous sense of delight is still present, but he is already saying that the only other thing he really wants to find on site is a complete carved spiral motif. UHI students under the supervision of Keir Strickland investigate the makeup of the mound in Trench T.
Elsewhere on site, work has carried on today. In the paved passageway between Structures Nineteen and One, Lesley has revealed a very nice drain. This will be carefully sampled and recorded. 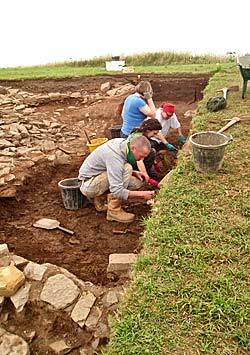 Claire, Jan and their team in Structure Ten have found segments of the original wall structure, while investigating the robber cut in the south-east corner. Happily, this confirms exactly the interpretation of the original interior form of the building as being a rectangle with rounded corners. Meanwhile, the Jims from National Geographic have been photographing the big, incised stone from Structure Ten. The simple concept of photography hardly does justice to the battery of technological elements which they have flung at this task. Filters, special lights, strobes and many hundreds of exposures have filled the afternoon and the results will no doubt be spectacular. Below, you have the account from the young Willamette, Molly, on her first dig, who found the carved stone ball. She may, as she says, now die a happy woman, but we hope she will hang on for a while yet, and perhaps find another one. 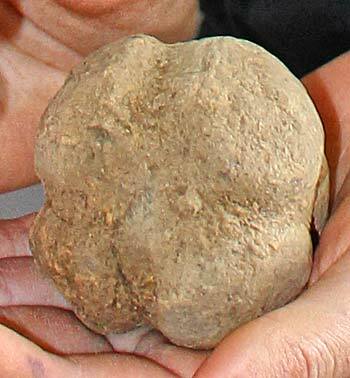 A closer view of the stone ball. Hi all! 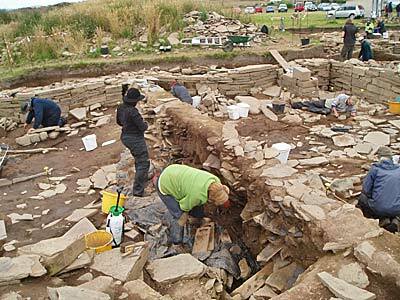 My name is Molly Bond and I’m writing to you today from the trenches at Ness of Brodgar. This coming semester I’ll be beginning my third year at Willamette University, but, for now, I, along with my fellow Willamette students, am here for the next week and a half of excavation. Trench T is the usual stomping ground of the Willamette students, but in the last few days we’ve been spreading our wings and (sometimes dubiously, due to our deeply held affection for Trench T) venturing out into Trench P.
I guess today was a good day to be in Trench P though, because we found something pretty exciting in Structure Ten. While cleaning around some stones, after having removed rubble from the area, I came across a carved stone, one of the few to have been found in context in the Orkney Islands. The stone fits about into the palm of my hand and has six knobs (four in a circle and two on top). 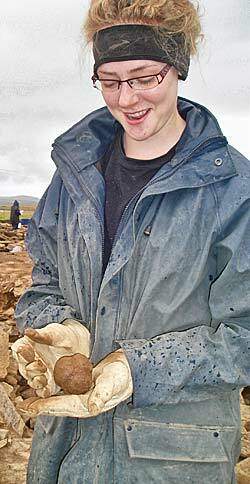 Prof Mark Edmonds can’t hide his delight at the discovery of the carved stone ball. 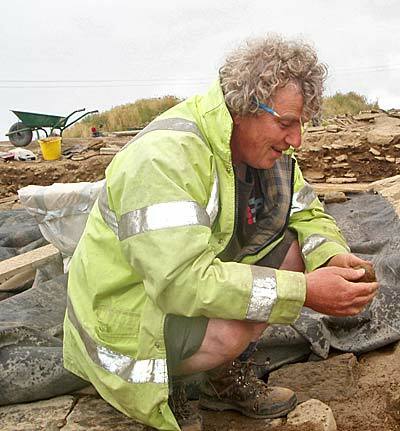 After calling out that I had found something, the first thing I remember hearing was an “Oh my God” from Professor Mark Edmonds, who was supervising Tom and I as we trowelled. I knew for sure then that what I had found was pretty special and discovered soon after that they had been hoping to find a carved stone for quite some time. Apparently, Nick Card now owes me a bottle of whisky. Since the carved stone is probably the most exciting thing that I ever could have, or will, find, I suppose I can now die a happy woman. But I’m still excited to trowel and hopefully come across more pottery, maybe a foreign stone or two, and have my fingers crossed for another piece of flint.